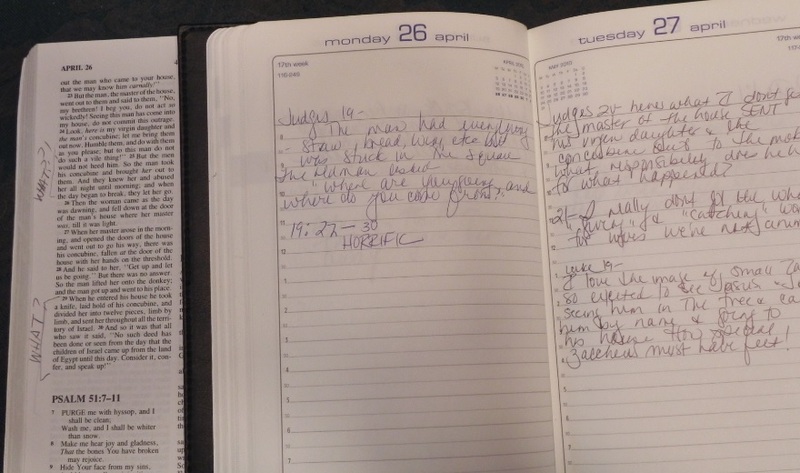 I used a daily devotional Bible and kept a journal of notes and questions. Judges 19 and 20 – one of the stories in the Bible that still haunts me. Religion, faith and spirituality have played a large part in my life – both good and bad. So it only makes sense that I address the issues as I muse on 50 years. There’s no way I can tackle them all in one post so I’ll break them up. Today? The Bible. Or more specifically, reading the Bible. Of course, I told him, but as the words came out of my mouth I felt this check in my gut. Wait, I said. I don’t know. I haven’t really thought about it like that. Turns out that a lot of my answers to his questions were “I don’t know” or “I hadn’t really thought about it.” How he managed to actually find enough to use for the book is amazing. I met John in 2005; over the next year or so we talked many times but his questions challenged me. So I set out to read the entire Bible, cover to cover, to find out if, in fact, I believed everything in it was true. This one harkens back to one of my first posts, “We’re just frosting on the cake“, where I talked about the vastness of the universe and the impossibility of man to know what’s beyond our own universe, making the case for God. 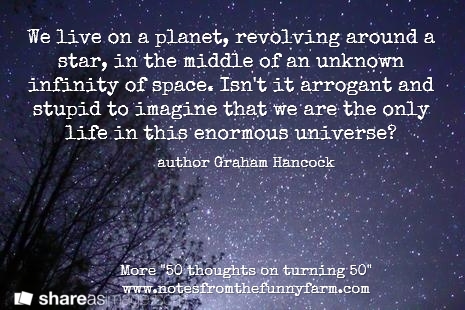 I’ve learned over the years that questioning other life in space is just part of believing in an infinite eternity. If you can believe a Supreme Being – God – spoke the world into being, then it only makes sense that there’s more out there than we can observe or even contemplate. Life on other planets? Why not? Maybe, as someone once said to me, there’s a planet where they got this whole thing right. So I’m up at 7 AM because I need to write. Not want to write or have something I’d like to think about writing. I neeeeeed to write. Like, if I don’t write it, it’ll cause me great pain. It’s about the concept of following God. As you know, I’ve volunteered for a project recently. Without going into a lot of details, I was ready to work. Ready, willing, and able to do this and this and that, because I’m very experienced at this and this and that, and I’m very good at this and this and that, and the project needed this and this and that. Perfect match, right? So I volunteered. And talked at length about doing this and this and that and thought I was part of the team and all was good. The problem, of course, wasn’t the project. The problem was me. I was focused on what I’d volunteered to do, not on what was being done. Sure, I can do this and this and that, but maybe this and this and that isn’t needed any more. Or maybe someone else stepped up to do this and this and that and they do it just fine. But I wanted to help. I wanted to be part of the whole thing. I offered and they said yes and then everything moved and I was left behind. Really. Even I see how glaringly arrogant that sounds. So lying in bed last night, feeling left out – boo hoo for poor me – it occurred to me that if I focused instead on what did happen instead of what didn’t, maybe I’d learn a lesson. 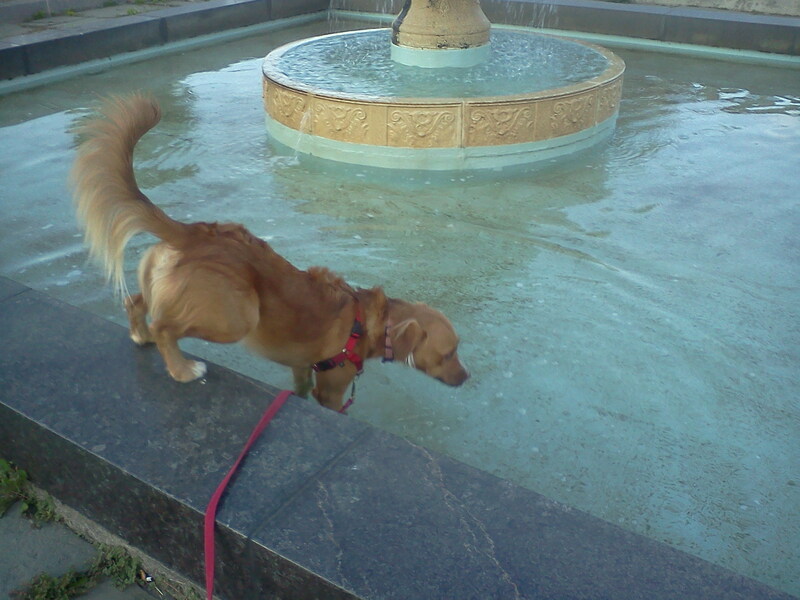 I needed a photo to run with this post, and Bailey taking a dip in the Fountain of Eternal Life at the cemetery seemed as good a choice as any. It’s been a crazy week, what with my outing to McGraws last Thursday and my last minute decision to attend my 30 year high school reunion. That’s more social interaction than I’ve had in the last six months. But I’ve been mulling something over in my mind and I think maybe it’s fermented enough to mull over out loud. Regular readers of my blog (or my column) already know I freely blab about my creative fears, hopes, successes and failures. I sometimes feel like a creative train wreck. But I had a long chat last week with an old friend, Pastor Samme; we know each other from my days in Christian music. I had finally reached a place where, before I imploded, I needed desperately to talk to someone who knows and understands me (as opposed to, oh let’s hypothetically say, a relationship counselor of some sort who knows jack about me but still needs to offer advice because I’m paying her). And while I don’t attend his church (or any right now), I just knew in my heart Pastor Samme would understand what’s going on in my head and be able to offer some insight. I’ll never be a leader in my generation. I’m not even a leader in my dog pack. So I’ve had this book idea rolling around in my head for a while. It’s a great idea. I even had an agent tell me he’d work with me if wrote the proposal. I never did anything with it. If you read my blog earlier this week, you know that fear of failure, fear of success, and a host of other fears keep me rooted in place more often than not. Anyway, while doing some research for another idea I set out to contact a writer who I once worked with at another publication, and lo and behold, she has written a book that is very, very, eerily similar to my idea. Got a major endorsement from a famous name in Christian circles calling her the next leader in our generation, blah blah. She didn’t steal my idea, I’m not saying that. It’s a very general idea, and once I can’t believe more people haven’t written about. She just wrote the stupid book I never did. Someone once told me that God will get the job done, whether or not you obey when he gives you the assignment. Is that what happened? Sigh. I’ll never be a leader in my generation. Shoot, I’m not even a leader in my own dog pack. Then again, maybe I’m not supposed to be a leader of my generation. I’m just supposed to do the job God gives me. If I fail, I have to believe he’ll use me again. I feel strongly, for example, that my mission right now is to be a voice for people who can’t find the words to say what they need to say or find a way to make people listen.